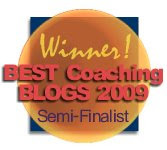 Self Help Goddess Blog: Addicted to Perfectionism? "Wreck this Journal!" Are you addicted to perfectionism like I am? Let’s kick the habit once and for all! 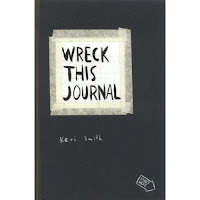 I just discovered a fabulous book called "Wreck This Journal" by Keri Smith and joined a 30-day book blogging experience focused on this book. The experience officially started this past Friday, and I will be posting about my experiences with this book every Friday throughout the end of June. If you have a blog and want to go through the experience with us, join us! It’s never too late to join (I actually joined a few days late myself). Even if you don’t have a blog or don’t want to post your experiences, I still encourage you to pick up a copy of the book and go through this exercise on your own. "Wreck This Journal" is not your typical book. The pages are not filled with words, nor does it tell any particular story. Instead, each page contains instructions about how to literally destroy the book! For example, one page tells you to burn it. Another page tells you to spill coffee on it, or poke holes through the page, while yet another page tells you to take the entire book in the shower with you! Trust me, the point of this book is to completely destroy it by the time you are finished with it, hence its subtitle, “To Create is To Destroy.” The premise of the book is that many of us hold ourselves back creatively because we are scared of mistaking a mistake or not "coloring withing the lines." This book actually encourages you to not only color outside the lines, but to destroy the lines once and for all! Now, I don’t know about you, but for me books are like my best friends. When I order a book from Amazon and it arrives with a slight fold in the corner or a scratch on the cover, my heart literally sinks. I keep all of my books in pristine condition, and even when I take them in carry-on luggage aboard airplanes they are carefully wrapped and protected so they can’t be harmed in any way! When I purchase books in bookstores, I always make sure to pick the one that is in the best condition. This 30-day exercise is definitely going to be a challenge for me, but one that I’m ready to embrace! I’ll post pictures as I go along, but I’ve barely even started the 30 days and I’ve already noticed challenges coming up for me. First of all, when I went to purchase the book I had to ask a saleslady at the bookstore to help me locate it. When we finally found it, it was sitting on a table with other books and the saleslady just grabbed the top copy and gave it to me. But the top copy had scratches on the cover and lots of fingerprints from other people who had looked at it! Normally I would have immediately put this copy back and taken one from the bottom of the stack, but not this time. I just smiled at the saleslady, said thank you, and took a deep breath! “You can do this,” I told myself. One of the instructions in the book is to take the journal with you everywhere you go. Once I had paid for it at the bookstore, I put the book in my purse unprotected... GASP! Normally I would never do this. I would keep the book in its own separate bag, so that nothing could touch it or make any markings on it. But I threw it in my bag, right alongside my keys, suntan lotion, phone, wallet, you name it… and I just took another deep breath and kept walking! I have yet to do any of the exercises in the book because I’m still getting used to this whole idea of destroying a precious book, but I did manage to hurl the book on the ground once I got home from the bookstore and that felt slightly liberating. I am a perfectionist, especially when it comes to books, so this is going to be good!! Join the fun and do this experience with us! To check out the other bloggers participating in this experience, go here. 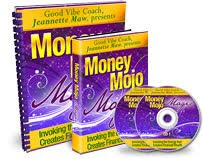 Thanks to Ana at Creatuitive Coaching for recommending this book in her latest newsletter! lol, i love how you said you hurled the book on the ground. good for you!! looking forward to sharing the rest of the journey with you. 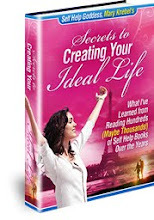 You're getting me motivated to start this journey myself - I've signed up but have yet to buy the book! I laughed. And you'll notice I'm only participating vicariously. It's just too much for me. Thanks for your support, ladies!! I tried ripping the cover and a few pages today... it's quite liberating once you get started!